I’m lazier than I thought. Cities have started to embrace their bike-riding commuters. More and more bike lanes are appearing on city streets as transportation departments realize that more bikes means less congestion. For longtime riders, it's a blessing. For those bike-curious folks, the chance to get to work without weaving in and out of cars means the jump to riding to their job is less daunting. The only problem is, while you want to be a better, fitter person, what if, like me, you're out of shape and the thought of riding a bike (especially up the hills of San Francisco) is a bit intimidating? That's where e-bikes like the GenZe 200 Series come in. With its assisted pedaling, the bike gives you as much of a helping hand as you need. It can even operate like a low-level motorcycle, at up to 20 miles per hour, and has a connected app. As a bike, it's great. As a connected device, it still needs a little polish. The $1,900 200 Series has some solid numbers. It has five levels of assistance (1 being the lowest level, 5 the highest). At level 1, it has a range of up to 40 miles. More than enough for most commutes. There's also the "zero" mode, which activates a handlebar throttle for effort-free speeds of up to 20 miles per hour. 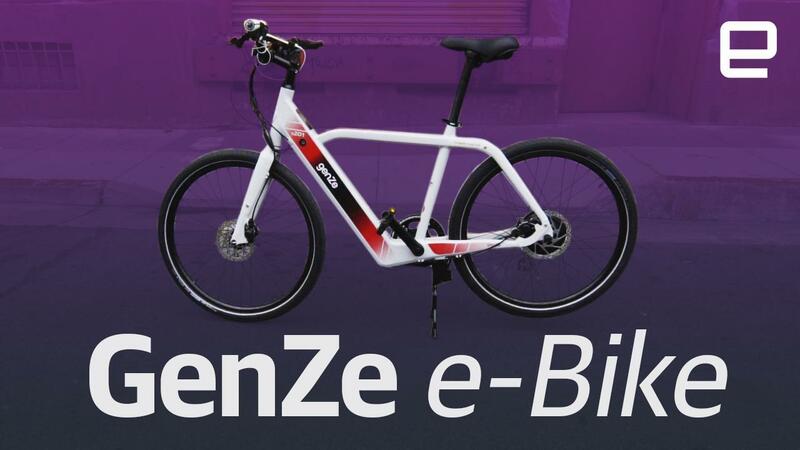 Going full lazy like this will get you up to 20 miles of range, according to GenZe. Even at its lowest setting, the assistance is apparent once you start riding. You get a sudden feeling of acceleration when the rear wheel's 350-watt hub motor kicks in that's quite satisfying. Sure, you're pedaling, but the bike is giving you a boost that lets you keep up with more experienced riders. Which is nice, because typically I'm the guy trying to catch my breath while blocking bicycle traffic. During a round-trip commute of approximately 11 miles through varying San Francisco terrain, the 200 Series kept me moving even up some pretty steep gradients. I will note that my 220-pound frame did tax the pedal-free zero mode enough on some hills that I had to actually help the bike out. Your experience may vary, based on your weight and local hills. On 95 percent of my ride, I used the highest level of pedal assistance: mode 5. During that trip, I depleted 42 percent of the battery, which, if you factor in my weight and the hills, is pretty much on par with GenZe's range estimates. The bike has eight gears, but frankly, once I got going, I always set it to the highest gear. Only when I had to take off on hills did I lower it. On flat terrain, once you pump the pedals a few times, you're off, and downshifting just makes your legs spin faster, with no actual benefit. So the bike itself is great on its own. But GenZe (which also makes a scooter that we've ridden a few times) added a companion app that connects via Bluetooth. Technically, it just updated the scooter's app to include the bike. It's great for data junkies and seeing how much actual battery life is left on the bike. GenZe even added a mount and, more important, a USB port to charge your phone while riding (because map apps are battery hogs). The app displays local weather, the battery condition and your range, logs your trips and shows you how much effort you put into a ride. For example, during a ride home, I exerted only 33 percent of the power needed to get to my destination. To be fair, there were a lot of hills and, as I say, I'm out of shape. Nonetheless, that information is helpful for anyone wanting to be more active. Maybe on the next ride you'll do a bit more work and that'll increase over a few months. Now you're in better shape while getting to work without showing up the first few weeks incredibly winded and sweating through your clothing. But there is a rub. The app's mapping feature is a disappointment. It uses Google Maps, but when you put in a destination, it seems to offer car directions. San Francisco has lots of newish bike lanes in or around high-traffic areas. The app's routing feature seems to ignore those and directs you down streets that aren't bike friendly. Fortunately, because of the bike's mount and charging port, I was able to just use the Google Maps app directly, which does take into account the many bike lanes in the city. Even though it steered me to more hills than I expected. Thanks, Google. The closest rivals pricewise to the GenZe e-bike are the Rook Electric Cruiser and the Magnum Metro Plus. Both have slightly more range but are 10 pounds heavier than the 46-pound 200 Series. Also, neither has a connected app, but they do come with rear racks that you have to purchase separately for the GenZe. Yet even with a wonky mapping system, the app and its hardware additions of a phone mount and USB charging port are nice touches to the solid 200 Series bike. It's a turnkey solution to a better commute. Cities continue to grow and the infrastructure can't keep up, so we're seeing more and more gridlock. Bikes get around that. Plus, they don't pollute, they're quiet, and they give you the cardio workout that so many of us are sorely missing. You'll also get to work a bit more refreshed and, more important, not super sweaty for the morning meeting.